Microsoft provides several update options, called Update Channels, that put application updates into different frequencies that you can customize to your user environments. Here’s an outline of the three channels and their primary differences. Security updates in this channel are provided monthly, non-security updates are semi-annual. New features are released a couple or few times per year, in January and in July. 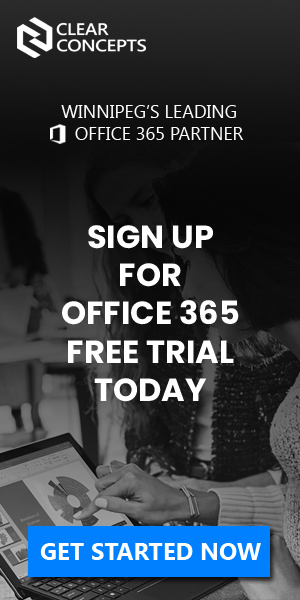 Your Office 365 Pro Plus subscription stays current over time, but is not exposed to risk by early feature inclusions; features that are included in Semi-Annual Channel have already been released previously in Monthly Channel. The purpose of this channel is to provide a set of your users the option to get new features twice a year, in March and September, about four months earlier than the Semi-Annual Channel. Security updates in this channel are delivered monthly, non-security updates are monthly. New features are released a couple or few times per year, in March and in September. This is a common pilot-user or application testing user channel, as it provides an early look at what will arrive in the Semi-Annual Channel. Features that are included in Semi-Annual Channel (Targeted) have already been released previously in Monthly Channel. 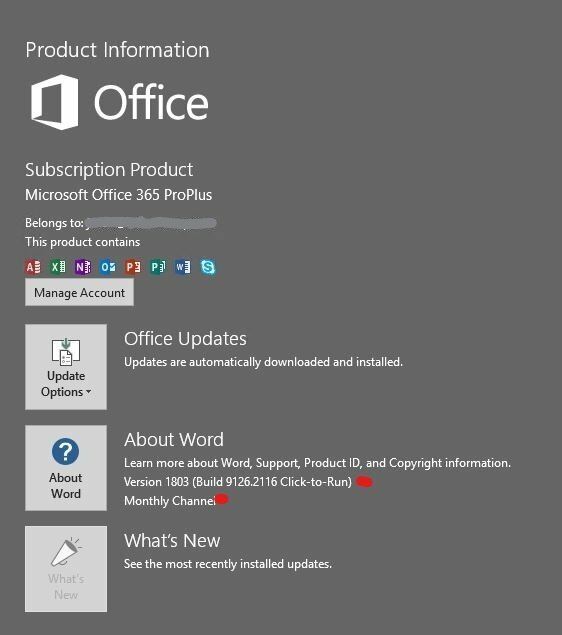 This channel provides users with the newest features of Office as soon as the features are made available. This is suitable for users who don’t have many line of business applications or macros or other application add-ins that could be impacted by new features in Office suite applications. Monthly Channel is typically available each month but this is not a hard schedule. Updates in this channel are cumulative; the current Monthly Channel release includes all features, security updates, and non-security updates from previous Monthly Channel releases. Monthly Channel is the default channel for Visio Pro for Office 365, Project Online Desktop client, Office 365 Business (the version included in some Office 365 plans such as Business Premium). There is also a Monthly Channel (Targeted) update channel that provides early access to the next Monthly Channel release, typically about a week in advance. Configuring the Update channel depends to a large degree on your environment. You can provide users with Semi-Annual Channel (Targeted) updates by selecting them in your Office 365 tenant portal in Settings > Organization Profile. This can be configured for all users or selectively for individual users. You can manually change an Office 365 subscription from one channel to another, via registry key changes or via command prompt as shown next. Our current version installed for this is a recent 1803 build, and is configured for Semi-Annual Channel (Targeted). And in this example, we will switch to Monthly Channel, so our variable keyword to use in step 3 below is Channel="Current". Launch a Command Prompt as an Administrator. 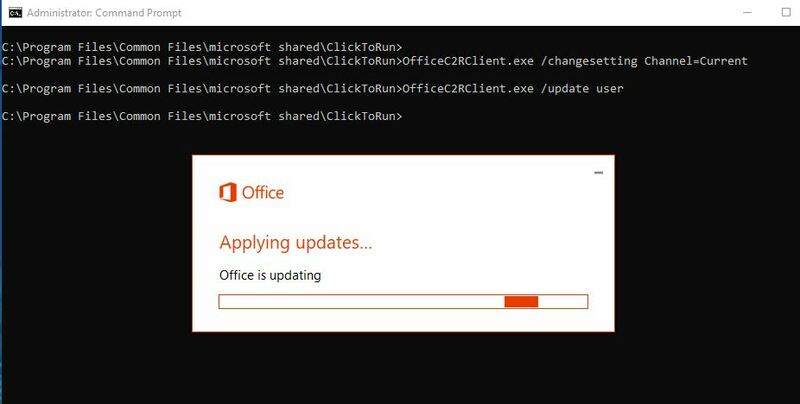 To implement the change and start the Channel switch process, run “OfficeC2RClient.exe /update user” from the same path. 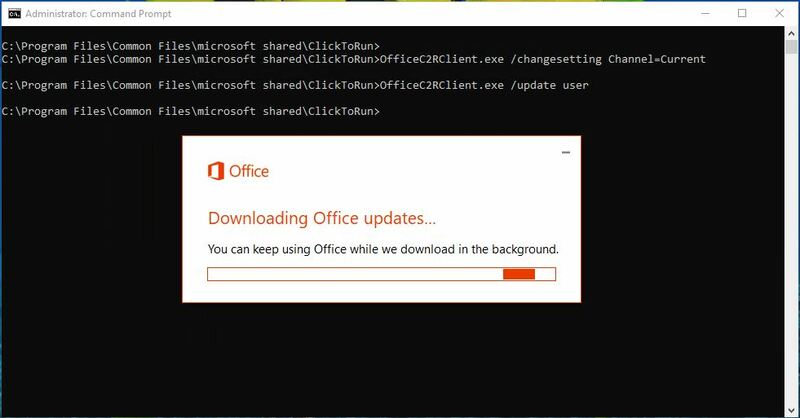 This will initiate office updates download based on the channel you are switching to. And on conclusion, we can verify that our version is updated now, as well as the channel reflects the change to Monthly Channel. 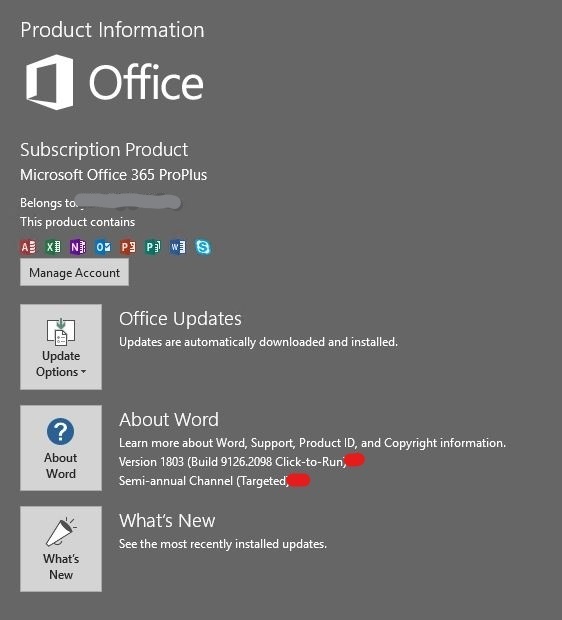 The semi-annual release cadence for Office updates channels gives IT departments and users plenty of update options. There is only the most current Semi-Annual Channel (Targeted) version supported at any time, and there is always more than one supported version of Semi-Annual Channel available. If you want to update only once a year, there is an available supported version for that scenario. So whether you wish to stay current monthly, or update slowly and less often, there is a configuration option available. Add to this the option of selecting users individually with standardized configuration settings like GPO and optional methods like manual or Portal-based configuration options there is a lot of means for IT to control update channel settings and allow for flexible customization for individuals. 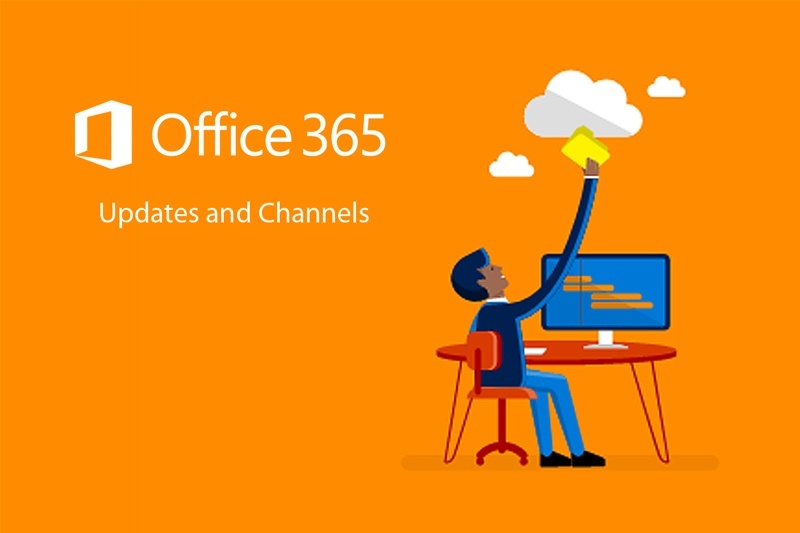 Let us know what your experience has been like managing Office 365 updates and configuring update channels! If you are interested in implementing an automated or customized update configuration for your users and want to learn more, reach out to our service and support team for assistance! Jason is an IT Pro with more than 18 years experience designing, implementing, and supporting technology solutions for business customers. He is the past president of the Winnipeg IT Professionals user group and was previously an eight-time recipient of the Microsoft MVP award in the Windows Server and Solutions category. When he isn't working he probably has a fishing rod in his hand, or he is cooking food on a grill or smoker in his back yard.